Are you sitting comfortably? 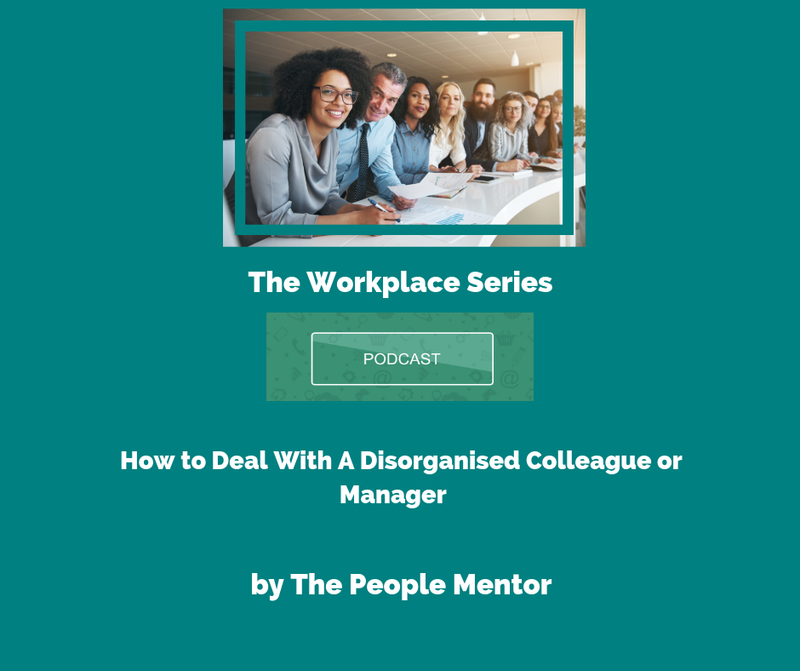 Welcome to my series of podcasts that will help you to navigate those inevitable difficult events that can occur at work. Today, I want to talk about how to deal with a disorganised colleague or manager. Everyone feels as if there are not enough hours in the day from time to time, but hopefully you manage to maintain a certain amount of order in the chaos. But what happens when your manager or a colleague is terribly disorganised and can’t seem to get their act together? It can be very frustrating and it can affect an entire team or organisation. How can projects be completed successfully if there’s incorrect, incomplete, or non-existent information coming from above? And how can a team be successful when one of the cogs in the wheel is not keeping up to speed? There are many ways a manager or colleague can be disorganised. Do you recognise these traits in anyone you work with? They’re always wasting time looking for things that they can’t find because they’re so disorganised. This person will usually have the most cluttered desk in the office. They don’t plan ahead, instead they just react to what happens so you’re always a step behind. They never delegate and this slows everything down. They can’t make decisions so the team never knows where they are. This can be terrible for motivation and morale. Who wants to work hard towards completing a project when they pretty much know that the goal posts are going to be moved again at some point? So how can you navigate working with a disorganised boss or co-worker and avoid being driven mad? Well firstly, think about their strengths. Maybe the fact they’re so disorganised infuriates you, but they perform really well in other ways, like being a good ‘ideas person’ or being adaptable to change. Next, you can help them get more organised by summarising discussions, meetings, or action plans in concise memos or emails. Rather than writing a long email, highlight key agreed actions so they know who has to do what. And don’t just look at the problems, think about solutions. If your bug bear is that your manager or colleague takes an age to respond to your emails (or never responds), ask them to confirm that they have received and read the email, and specify in the message when you would like to hear from them by. Chase them up if this deadline goes by and you haven’t received a response. If you need to speak to your manager in person, try to schedule a meeting away from their office if possible where there might be constant interruptions. For someone who is disorganised, distractions should be kept to a minimum. And always offer to help. Someone might seem disorganised because they’re overwhelmed and have lost sight of what they need to prioritise. So ask them to delegate things to you, and make a point of keeping them informed about progress. A job well done won’t go unnoticed. If you can’t physically take on more work yourself, there are other ways you can help. You could suggest software that can help them keep track of things, like cloud-based document storage and project management software where they can see tasks, track progress, and see deadlines at the touch of a button. You can also just simply listen. A boss or colleague who is disorganised and often feels overwhelmed might confide in you about being stressed and frustrated. Listen and make suggestions about how the situation could be improved. It will help them to get an objective view of things. There may come a time when you have reached your limit with a disorganised manager or colleague, and you feel angry, frustrated, and run ragged. In this case, be direct, but do so with respect. Explain how the team and organisation is being affected, and even say you’ve noticed that it’s been affecting them. This will feel less like an attack then. So, there are steps you can take to make life easier for a disorganised boss or colleague (and you and your team), but a change in behaviour on their part is also needed, and that can take time. I hope you got some useful tips from this podcast and I’ll see you next week for the next one in the series.